Casa Linda vacation villas offer a fantastic Caribbean holiday inyour own house, with private pool & great services!. Enjoy the wonder of the Caribbean with full amenities,friendly staff, and your own space. Make it a vacation you'll never forget! Added services like airport pickup, in-villa massages. vehicle rentals, dishwashing, & more! Ask us for details. We help with everything, even booking tours! We offer Shuttle Bus Service for FREE! Pick up and drop off in front of yourvilla several times per day! 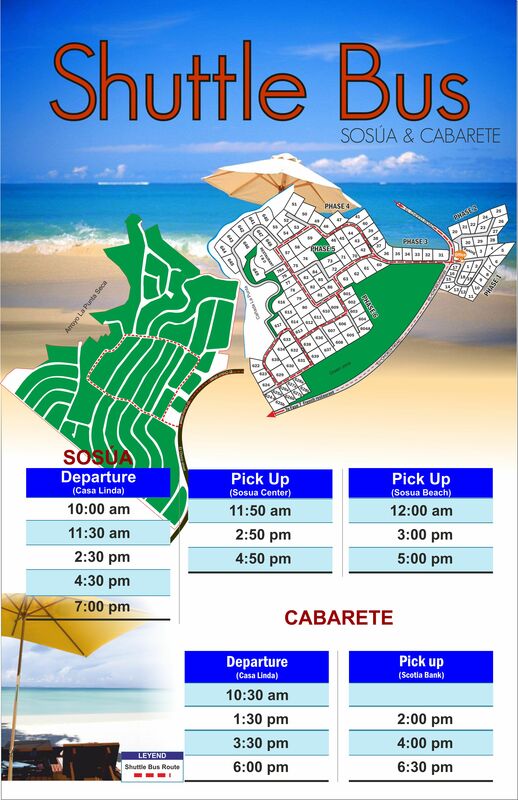 Service to and from Sosuaand Cabarete. Click here for schedule. It is our privilege to provide you with a fun, safe, and relaxing vacation.